Runners get a chance to run through the city known as “Utah’s Dixie” at the annual mid-January running of the St. George Half Marathon & 5K — the race marks its 38th anniversary in 2020 — along a race course that features paved city trails that wind along the Virgin River, which flows by just south of the city. The city, which got its nickname thanks to both its usually very warm climate and its history as a mission founded by Brigham Young, who sent Mormon farmers south from Salt Lake City to grow cotton here in the state’s southernmost regions back in the 1860s. Though the experiments with growing cotton here were abandoned within a few years, the nickname has stuck and remains to the present day. With the exception of the first couple of miles of the route, the course offers runners participating in the half marathon a mostly fast and flat route that starts and finishes at the Dixie Convention Center just off the Veterans Highway, and incorporates some of the route used in previous years, including stretches near Red Cliffs Mall and Fossil Ridge Intermediate School, which lies just a short drive from the mall. In between, runners follow what is roughly an out-and-back route to the turn near the Veterans Memorial Highway, and then back again along the river to the finish. 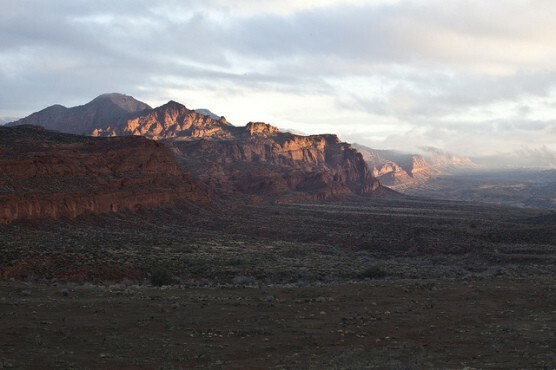 Along the course, runners can expect to find paved trails that wind their way through the river valley as well as ample views of the scenery for which this part of Utah is so well-known — the red bluffs that look out over the northern part of the city, as well as the edge of the Mojave Desert to the south and Zion National Park off in the distance, as well as the peaks of the nearby Pine Valley Mountains. More than 1,100 runners crossed the finish line in the half marathon and 5K combined in 2016, in addition to the dozens of kids who took part in the event’s Tuff Kids Mile, Half Mile and 200-meter dash races. The half marathon race begins at 9:00 AM, and features a course time limit of 3 hours, 30 minutes — which means you’ll need to keep a pace of 16 minutes per mile or faster. Located in Utah’s southeastern corner, just over 120 miles northeast of Las Vegas, St. George typically experiences very hot summers, but moderately cool to cold weather conditions in January, when the city’s average monthly temperatures range between 29°F and 55°F. On race day (Jan. 18), the average low is 29°F and its average high is 55°F, while rainfall totals average just under 1.3 inches and snowfall totals average about 1.5 inches for the month, making January the city’s wettest month of the year on average. See the race route map for the St. George Half Marathon here. To reserve your spot in the winter 2020 running of the St. George Half Marathon or 5K race, visit the event website below. Ever run in the St. George Half Marathon? Share your impressions here, or post your review in the Comments box below. when will the 2018 results be posted? I am a pacer and when entering today the pace code pacer17 was not allowed. Is there a code that works? Do you have a picture of what your 1/2 marathon finishers medal looks like?